Great to see you back. 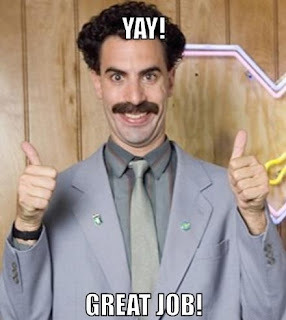 How has your week been? A tricky subject because dysfunction can be obvious and subtle. This post is in no way trying to be confronting like I have all the answers, because I don't. These are simply a few things I have been taught and thought a good idea to share. As always with these posts, take out of it what you find useful, dismiss what is not. I'm by no means an expert and the aim has always been to offer up my own learnings to promote sharing and empowerment. Feel free to add in your own thoughts or suggestions in the comments below. So this is specifically in relation to teams that somehow lose their way, get caught up in frustrations from small issues which then eventually become near impossible impassable mountains. 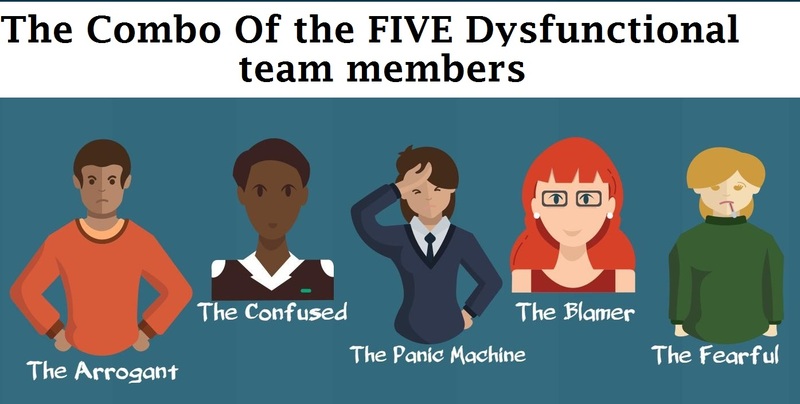 Team dysfunction almost always increases individual anxiety, pushes up absenteeism, creates friction, causes collective stress (and often perception changes of how an entire team "views" things) and generally lessens the team's effectiveness in working towards their common goal. Bottom line - it can affect a teams reason for existing. More often than not, workloads go from "coping" to "impossible", even without actual workloads actually increasing. Again, its that perception thing. I've been very lucky in my working career to have worked with a great many teams and individuals. 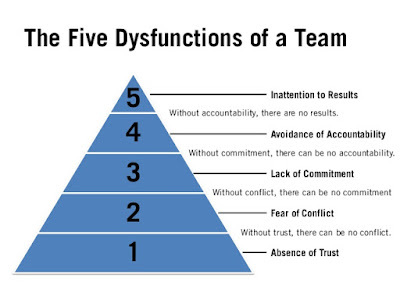 I've run high performance teams, varying levels of dysfunctional ones, right through to supposedly "broken" teams, those of which, thankfully didn't remain that way for long. But how did I turn the two latter types around? No, I'm not the worlds greatest manager. I just employed some awareness and realised a few home truths, things I have been taught. NO ONE COMES TO WORK TO DO A BAD JOB. There are always other factors that prevent individuals from being positive members of their team. Realising these key features (for both you as a team member or as the leader) can certainly help how the team progresses from that point on. Being aware there is dysfunction is half the battle. The next key feature relates to the below picture - taken from works by "The Table Group's CEO, Patrick ​Lencioni - click http://www.tablegroup.com/ to learn more. 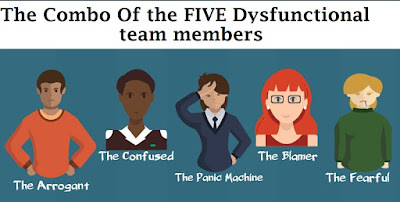 If you are the leader of the team, in my experience it has always been vital to work on repairing each of these 5 dysfunctions via working both one on one with the team members and as the entire group themselves (so everyone hears the same thing, a consistent message from you). Just as important, if you are the team member, it is your job to be aware of the dysfunction and work on addressing each of the issues for yourself within your team, as a part of it. For instance​ with your new awareness of any dysfunction, you have to take some responsibility too and look at yourself. A team is only ever as strong as its members, right? What if you're inadvertently adding to the dysfunction? As a leader or member of the team, a good thing to try - ask yourself, are you (perceived or actually) any of the following people? If you are, then the time has arrived to do something about it. You didn't come to work to cause others problems did you? I'm betting you said no, of course not. The trick will be if you can be honest enough with yourself to answer accurately. If you have been perceived as being The Arrogant, start being more empathetic, try to understand the challenges your fellow team mates are experiencing. Empathy is something I cover often in high performing teams as this can often be lost in the pursuit of better measurements. It is a solid method of seeing something from someone else's perspective. It can also change your own. If you're The Confused, make a list of the things you're confused about and get the answers you need. It's amazing how knowledge can deal with confusion. So many people dig themselves holes by not fronting up to say they dont understand something. Ask yourself a question - which is better? To know how? Or to pretend you know how? You get the drift. If you're The Panic Machine, try and figure out why you feel this way all the time. A good tip is to deal in facts and logic more often than dealing with emotions. Emotions are good, but if they're causing you to panic with knee-jerk reactions, go with logic and facts about what is "actually" happening, not what you're afraid "might" be. Consider this - if I tell you "dont think of a purple elephant". Read that again. What did you do? You thought of a purple elephant, right? This proves hacking your brain is possible. Find your purple elephant. The Blamer - is nothing ever your fault? Are you absolutely sure about that? Not taking responsibility for your actions or your part in actions is detrimental to any team make-up. Likewise, if you are the leader and The Blamer, then you are creating a culture of fear within your group. This behaviour from a leader creates all five of these types. Like the arrogant one, employ some empathy and look around as to how people are reacting to you. You might be surprised. The Fearful. Ok, you, my friend, need to have more faith in yourself. Helps to know that fear often comes from a combo of confusion and panic that occurs in situations you think/feel you are ill-prepared for. Worst case scenario feelings. History can also be an influence on you too. My best advice is to read some of my other posts or google up what you can do. All you need is a little bit of self-belief, ensure you have an accurate picture of yourself and to develop some trust so you can ask the questions for the answers you need to feel better. And trust me. You can do it, the world wont end if you admit your fears. You may also be one of each of the types at different times of the day, week, month or year. Is there a trend you can see? Do you always become the Panic Machine every time you deal with a particular person? Or Blamer when dealing with someone else? Either way, being aware is again, half the battle won. As the leader of the team and you have these people within your team, it is always your responsibility to help them/facilitate the changes these people will eventually want to strive for under your guidance. By helping, you can address the 5 dysfunctions of a team as represented in the pyramid. But most of all, remember, no team is ever broken. Some do lose their way at times but believe me, success is never as far away as you might feel it is in the beginning when you realise something might be up. AGAIN, NO ONE COMES TO WORK TO DO A BAD JOB. Once you deal with the barriers causing dysfunction, your team will feel better about themselves as individuals and as a team. Team cohesion will begin, smiles will start being a lot more common, the ability to empower rises up and any historical-type difficulties will be handled by yourself and those around you, almost to the point where the team can self heal from injury. This post only just scratches the surface of what's possible, like I said, I'm no expert. I make plenty of mistakes, and I'm still learning. This is simply stuff I've been shown and taught in the past and is tried and tested - it works. Yes, it will take effort and yes, it will take time and yes again, you may make mistakes too, but the thing is, if you are the leader of a team that is struggling, it is 100% your responsibility to help them resolve the issues as best you can. You have to try. You were put into your position as a leader for a reason. Back yourself like you've been backed, get advice if you need it, and get in there. The effort now will save you time in the future. 100% guarantee. Likewise, if you are the member of a team that isn't running right, you have a responsibility to help it too. Look at yourself, look at those around you. You already know everyone would prefer to be happier, right? And since you're all in this together, doesn't it make sense to do something about it? Consider the alternative. What if no one does anything? Your team will become even more miserable, some people will leave, your team may collapse entirely. I sincerely hope some of this has helped you. If you have any questions or even just some clarity around some of the points, please don't hesitate to ask. If I don't have the answers, I'll find some.